There has to be a logical explanation why Gayle Sayers is on this card and not Walter Payton. Yes, I know he is dead as some people pointed out in the comments but I'm talking bigger picture here. Cut auto?The next time someone talks to Greg Kohn or Chris Carlin at Upper Deck can we find out what the deal is? It has to be a licensing issue. I haven't seen Payton cards in awhile so whose got the license and why isn't it Upper Deck? Sanders retired before he would have broke Payton's record. Emmit did break Payton's career rushing record. 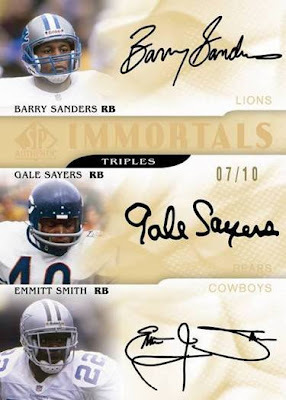 How cool would it be to have Sanders, Payton and Smith auto's all on one card? The last 3 backs, all in my lifetime to hold the record. Somebody please, make it happen. Um, because Payton is dead? No no no no. Thanks guys I know he's dead. Hello, cut auto? Inset in a die-cut window in the center with the other 2 right where they are? Cuts and non-cuts inevitably end up looking like Frankencards. Its a good thought, but I think if they did it that way, most people would be complaining about how it looked. I would guess that the population of the Payton autos is just not that high.